Looking at Oslo City Hall as seen twins Stockholm City Hall. The main equation of course the second City Hall was used for the grand celebration of the Nobel Prize every December 10. Another equation is the architectural style of the two buildings that are so similar, it looks simple, but still majestic and using red bricks as the main material so that members unique red mosaic pattern on the wall. Both City Hall in Oslo and Stockholm, the second building is in the list of buildings that you must visit when visiting one of the countries that host the Nobel Prize. Oslo City Hall designed by Magnus Poulsson and Arnstein Arneberg and built from 1931 to 1950. Construction was delayed due to World War II. 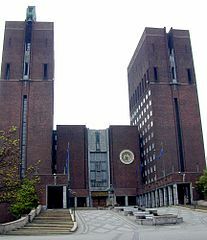 Now Oslo City Hall into the building that dominates the outskirts of the Oslofjord and surrounded by several important buildings in Oslo, the Nobel Peace Center. Aker Brygger, and Akershus Fortress and Castle. Oslo City Hall building looks magnificent, but still understated. Sculpture that adorns the front page of the building is dominated by a variety of groups working class figures to depict the socialist class in society and government. In addition to carving sculptures decorated, wall Oslo City Hall is also filled with reliefs of gods and goddesses mythology tells Norway. Another thing that became an icon of the Oslo City Hall is a large clock tower located in the east, has 49 bells that chime every hour and came up to street Karl Johans Gate and the Royal Palace. Oslo City Hall is similar to the Stockholm City Hall, they see themselves only major difference lies in the price of admission, you can go in Oslo City Hall for free, while to enter the Stockholm City Hall to pay a ticket, you will get another one free attractions in Oslo, especially This is one tourist attraction to be an annual event venue Nobel Peace Prize is the pride of Oslo. When entered the door of the Nobel Peace Prize, you will be greeted by a large hall or the so-called Great Hall which has always been a character witness Nobel Prize to world peace. Although understated looks, feels so majestic Great Wall design with high ceilings and filled with ornate murals all over the walls. Geometrically patterned marble floors combined with shading patterns, and some frescoes, marble color mellow paired with bright colors wall painting made by Henrik Sorensens that much about World War II. Meanwhile, in the middle of the room there is a podium where the Nobel peace laureate gave a speech and received the Nobel Prize.